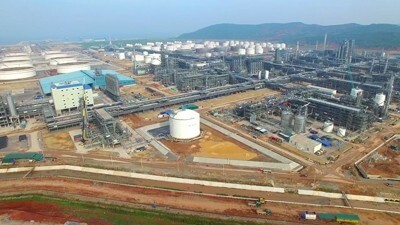 The Thanh Hoa-based Nghi Son Refinery is scheduled to produce its first batch of commercial products in May, as announced on February 28. After five years of construction, Vietnam’s second oil refinery is now ready to commence operations and will begin to receive crude oil for refinement. Once operational, the facility will help to ensure Vietnam’s energy security and contribute VND10 trillion (US$440 million) to the budget of the north central province, the management estimated. Turki Alajmi, general director of the refinery complex, said that this project is of strategic importance as it will meet Vietnam’s growing demand for refined oil products which are necessary for its industrialisation drive. Construction of the complex commenced in 2013 with total capital of over US$9 billion. The project is jointly invested in by four contractors, namely PVN, Kuwait Petroleum International, Idemitsu Kosan and Mitsui Chemicals, which hold 25.1 per cent, 35.1 per cent, 35.1 per cent and 4.7 per cent respectively. The facility has an annual capacity of producing 10 million tonnes of refined oil products.